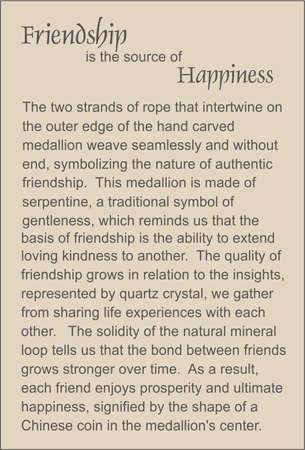 MEDALLION: Poppy-colored serpentine hand-carved medallion with two intertwining robes surrounding the shape of an ancient Chinese coin. ACCENTS: Taupe-colored serpentine globe and smooth rock quartz crystal ellipses. COMMENTS: Authentic happiness flows from quality relationships. Happiness also comes in miniature size. Scroll down to see.